A new Amazon feature first spotted by TechCrunch helps anyone with an iPhone find odd parts that might otherwise involve a trip to the hardware store. Called “Part Finder,” Amazon‘s new tool is one of the more useful computer vision tools to date. 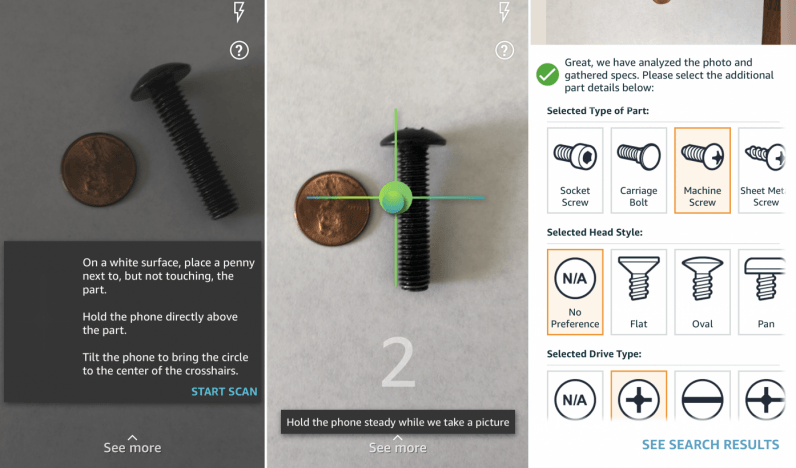 It takes advantage of the iPhone‘s excellent optics to scan, measure, and identify all types of fasteners or other pieces of small hardware. One found, the app asks for some additional information — screw type, head style, and drive type: Phillips, flathead, etc. — before leading you to the appropriate product on Amazon. To get to the tool, just click the camera from the home screen. From there it’ll take you to the scanner tool, the same instrument you’d use for scanning barcodes to reorder laundry detergent, for example. Once there, click the bottom of the screen where it says “See more” and the Part Finder tool is hiding in that menu. According to Amazon, the tool, in its current state, can identify over 100 types of fasteners which could represent thousands (or perhaps millions) of parts. That said, it’s still a work in progress. Expect enhanced functionality as development progresses. Although there was no official announcement, Amazon did confirm to TNW that the feature was available now to all iPhone users.